Perfect for company parties and events where you want to play mini golf or have a competition. You can also add a 3 hole mini golf course to this game for only $149 and you can have a crazy mini golf course or use the obstacles as a standalone mini golf game. 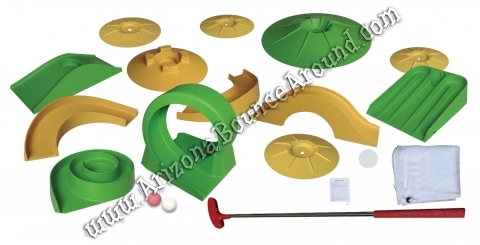 You wont find a better more versatile mini golf game rental in Arizona so rent one today. You can even have it delivered to your party or pick it up from our warehouse in Scottsdale and save the delivery charge. We are a carnival game rental superstore serving all of Arizona with mini golf games and activities for kids and family events. We also rent inflatable golf games and sports games.